At GBdirect we have been amongst the longest users of Unix-based systems in Europe. Our first contact with it was in 1978 and members of our staff have been well-known in the Unix community for 20 years. We are well aware of its strengths and weaknesses — and we don't see it through rose-coloured glasses. 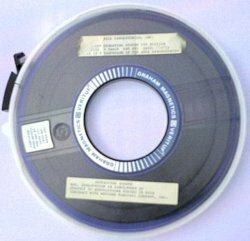 The image on the right shows a valuable antique; a 9-track tape direct from Bell Laboratories containing the source code of probably the first widely-used version of Unix — technically known as 'Sixth Edition' but universally referred to in the community as Version 6. This ran on PDP-11 computers and was happy on a machine with as little as 64K of RAM (yes, that's K not M), though 128K was a more common size. The entire system including its source and online documentation would fit on two DEC RK05 disks - 5MB in total, though you didn't get a lot of space left for user files. The tape is in our archive of Unix memorabilia. The image below is a detail from its label - notice the date (US format of course) of 14th July 1978. Having used Microsoft Windows on PCs for some time within the company, we gradually lost patience with its unreliability and huge cost of ownership — just about every time we had to upgrade a PC with a new motherboard or change its configuration we would have to re-install Windows - so we decided to switch over to using Linux. The experiment has been a huge success and we now have only one Windows-based PC in the company. There is no disputing the fact that desktop applications for Linux are not the equal of the better Windows products, but we find that we don't need them much and the fact that none - that's right none - of the Linux machines has ever - never - crashed has meant that we can get on with our business instead of cajoling and nursing slow bloatware systems that are too unreliable to use on a daily basis. The fact that we don't have to use top-of-the-range hardware is pleasing too. Our public webserver handles several large corporate accounts, lots of email forwarding and rewriting for various companies, acts as our firewall and router too (using an X.21 card) — and runs on a 486DX/66 with 32MB of ram and 2GB of hard disk. Nobody can remember the last time it crashed or rebooted and it typically sits almost totally idle, despite serving up around 200MB of web pages per day. At the time of writing it reports that it is 98% idle and that 14MB of real memory is in use (dunno what it must be doing with the rest then). The remainder of our once-Windows PCs now run as X-terminals (including laptops) and share files and compute power on the machine we know as 'Landlord' (all of our systems are named after beers, curry houses or pubs).This high-powered monster consists of a cheapo motherboard, two 6.4GB IDE disks and 128MB of RAM. It has yet ever to use any swap space. The processor is a Cyrix 266 MMX. It supports our SQL database, is our C++ compile engine and does just about everything else too, including act as fileserver to the other systems and the remaining Windows machine via the Samba Windows compatibility module. We thought we would miss Windows. We have been surprised to find the exact opposite. At the time of writing, our machines run on Red Hat Linux versions from 5.0 to 6.2 (N.B. we don't have to upgrade all of our machines, to run the latest applications).